For Witt and Clout on the winner, it was a continuation of a demanding race program for the pair over the holiday break. The two champion yachtsmen finished second, on Ragamuffin, in the Sydney-Hobart race and now look towards taking out a national title in the 18s. For the runner-up crew, it was also a busy period of racing in another class. Knapton and Bridge teamed to take out another Australian 16 Footer Championship and are top contenders to make it a 16-18 Footer double. NSW champion Thurlow Fisher Lawyers (Michael Coxon) sailed well to finish in fourth position, ahead of Triple M (John Sweeny) and De’Longhi (Micah Lane). Only one skiff (Asko Appliances) of the 19 starters failed to complete the course but showed enough form over the first lap of the course to make this team one to watch over the coming month of championship racing. While Appliancesonline.com.au took the lead immediately after the start, Asko Appliances showed plenty of upwind speed to cross Appliancesonline midway up the first beat to windward. When Smeg was slow with a spinnaker set after rounding the Beashel Buoy, Asko Appliances was left the chase the leader down the run back to Clarke Island. 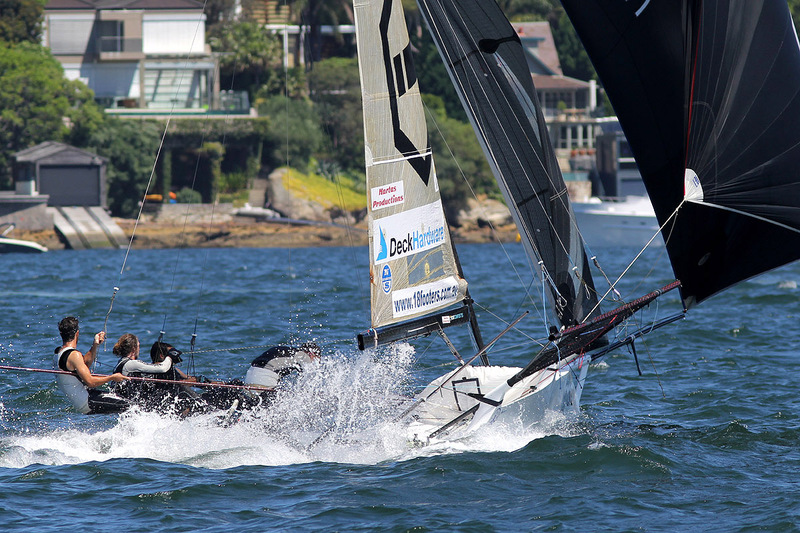 Asko Appliances actually grabbed a narrow lead as the two leaders approached the bottom mark, but Asko hit a ferry wave and the resulting capsize forced the team to retire from the race. Left with a clear lead over Smeg, the David Witt-led Appliancesonline was never seriously challenged over the following two legs of the course in the 16-18 knot North-East wind. The Smeg team had to keep a watchful eye on the challenges of Coopers 62-Rag & Famish Hotel (Jack Macartney) and Thurlow Fisher Lawyers but was always in control of second place. A big performance also came from the talented young team on Noakes Youth. This team has shown glimpses of form during the earlier half of the season, but seemed to be lacking in luck on a few occasions. Today they were well up early, but lost a few positions during the race. Showing championship qualities, the young team fought back to re-pass some top competitors and finish on the 18s podium for the first time as a team.